Flea markets are markets where multiple vendors gather to sell merchandise. They set up and sell their goods from designated spaces called booths or stalls, which they rent from the flea market owners or organizers. Though open-air markets with used goods were once the norm, today's flea markets may take place indoors, outdoors, or both. And, many flea markets offer both new and used goods. Traditionally, each flea market vendor stays with his booth and takes care of customer transactions. In most of today's permanent indoor flea markets, vendors stock and set up their booths, but they don't stay to work with customers. Transactions are handled by flea market employees and the market pays the vendors on designated days. The term flea market originated with the French marche' aux puces. It translates "market of the fleas" and referred to the likely flea-infested used merchandise. Technically, a swap meet is a gathering whether people swap primarily used merchandise. Today, however, most swap meet merchandise is sold instead of traded and the term is used interchangeably with flea market. What Is a Vintage Show? 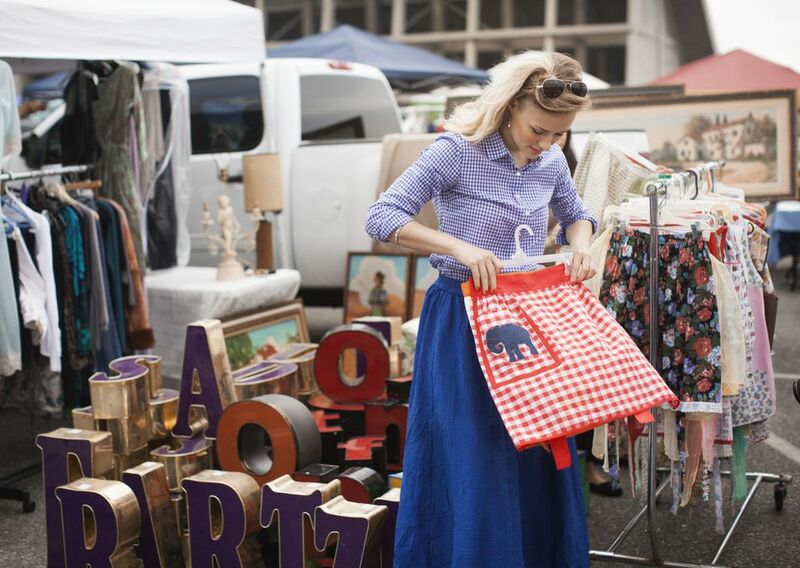 A vintage show is a relatively new term in the flea market world. It usually refers to an occasional sale where the goods (primarily home furnishings) are trendy and desirable, but not old enough to be antiques. The vintage items are frequently altered by restyling, upcycling, or repurposing. Most vintage shows are called curated markets, which typically means vendors are chosen on both the appeal of their merchandise and their talent in displaying it. Vintage market is another newish term and one that can refer to several different types of sales. In some cases, vintage market is just another name for a vintage show. Producers of antique shows and upscale flea markets occasionally use the term to refer to a special vintage section of the sale or even a stand-alone spin-off event. Some indoor booth malls are also called vintage markets instead of indoor flea markets or antique malls. What Is an Antique Show? Antique shows are indoor or outdoor sales featuring primarily merchandise that is at least 100 years old. Antique show goods are typically finer and pricier than those at the average flea markets. Some antique shows, such as the ​Springfield Antique Show, are priced to appeal to both resellers and private buyers. Others cater primarily to collectors. What Is an Antique Mall? Antique malls are indoor stores. Like flea markets, they rent booth space to multiple vendors. Some antique malls take the antique part of the term seriously, and they require that a specified percentage of the merchandise be at least 100 years old. Others use the word antique interchangeably with vintage; they just expect the goods to be old. Some call their businesses antique malls, but they actually sell everything from expired cosmetics to garage sale fare. Antique malls are frequently indistinguishable from permanent indoor flea markets. Barn sales are occasional flea markets or vintage shows that take place in a barn. What Is an Indie Market? The word indie is a trendy shortened version of independent. An indie market, such as the Treasure Island Flea, is one that features merchandise by indie designers instead of commercial manufacturers. What Is a Craft Show or Craft Fair? A craft show or fair is a market where makers sell their handcrafted objects. Craft shows may be held indoors or outdoors. What Is an Artisan Market? Like a craft show, an artisan features handcrafted merchandise made by multiple vendors. Using the term artisan market instead of craft show is savvy marketing. It sounds more upscale, and you picture professional potters and painters instead of hobbyists wielding glue guns. What Is a Pop-up Market? Visually, a pop-up market looks no different than an indoor or outdoor flea market selling similar types of merchandise. The term refers to the market location and schedule. Instead of taking place on a regular schedule, a pop-up market pops up somewhere -- and not always on a regularly-scheduled date. You will encounter single-location markets incorrectly calling themselves pop-up markets just because the term is trendy. But, if the event happens in a regular place at a regular time, it is not a pop-up market. A farmers' market is a food market. Fresh produce is the most prevalent merchandise, but many farmers' markets offer baked goods and dairy products as well.